WELLESLEY — A muscular buzz hums through “Christiane Baumgartner: Another Country” at the Davis Museum at Wellesley College. It’s not audible: It comes from pattern clattering over image. It is the fierce, staticky rumble of the concrete world dematerializing. The brilliant exhibition, organized by Lisa Fischman, the museum’s director, and up through Dec. 16, is the first solo museum show in the United States for the German artist, who is something of a rock star in printmaking circles. Carving with a kitchen knife, she makes monumental woodblock prints, some close to 7 feet tall. When she works at home, she sets the block atop her grand piano. There are smaller prints on view, but the big ones are the showstoppers. The scale is necessary. Baumgartner’s prints flutter between representation and abstraction, and viewers must step away in order to see what is literally a big picture. Up close, image dissolves into prickly abstraction. In addition to an image, each woodblock features a raster pattern, like the humming, electron-beam striations of old televisions. It’s a familiar, distancing filter through which to view the world, but at this size it also breaks the world up into bits that bristle and threaten. The artist often works from film stills, as in “Luftbild (Triptychon),” which has at its center an image of warplanes. She recorded it from a World War II documentary on an old TV. With time stopped, the screen’s convexity creates a jittering moiré pattern of great, overlapping arcs against the raster. Baumgartner is based in her hometown of Leipzig, a city of book publishers; she has worked as a typesetter. While her horizontal matrix recalls TV, it also sets her prints up to be read like text. And it has roots in a deep lineage of German printmaking: Albrecht Dürer would fill in dark spaces with similarly dense stripes. At the Royal College of Art in London, where she got her graduate degree, Baumgartner made digital videos, and the content of her prints has more in common with Gerhard Richter’s blurred paintings of photographs than with Dürer’s narratives. She raises questions about what’s real, and how mediums from books to digital technologies shape our perceptions of the world. 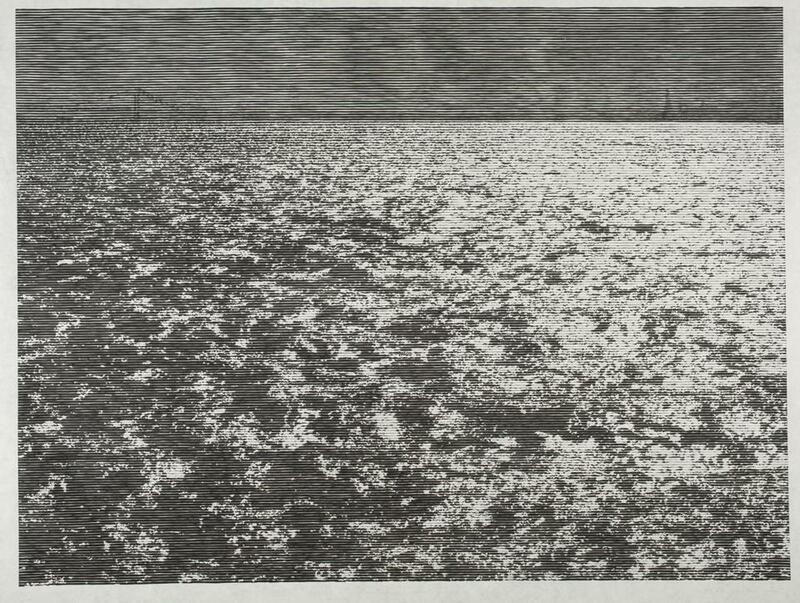 “Another Country,” the exhibition’s title piece, captures a sparkling expanse of the Hudson River, looking from Chelsea toward the Verazzano-Narrows Bridge and the Statue of Liberty, a shadowy sliver. It’s late on a sunny day. The water’s frolic, soothing and animated, reassures us of life’s constancy and its change. But up close, the lapping water breaks down into static; What appeared gray sharpens into black and white. Wave turns into particle. A century ago, Cubism conveyed the jagged fracture artists felt in response to tectonic shifts in society. Today, Baumgartner’s prints carry the frenetic energy of the real world dissolving into a virtual one. Printmakers can be over-the-top technical geeks, and for that reason Baumgartner does not like to think of herself as a printmaker. Her work is less about the making of the print than the notions behind it. She finds an image she likes, one she has shot herself, or something cadged from another source. She digitizes it, and then bitmaps it, breaking it down into a raster, rather like painters who use grids to chart scenes. Then she transfers the image onto her woodblock and sets to carving across its length, which can take several months. Every print depends equally on digital and handmade processes, the fuzz of a recorded image and the heft of the wood. In holding both, Baumgartner meditates on tangibility and time — do they, too, break down, as images do, into energetic specks that we sense but cannot grasp? And what is tangibility if you can’t get hold of it? That may be the scariest thing. Yet it’s consistent with Baumgartner’s imagery, which often focuses on transience and forces us to grapple with phenomena of swarming sensation. Lately, she has been making color prints. In the “Happy Hour” series, she renders sunsets over water, an old saw she bends in a new direction. She drenches these prints in chemical tones. The horizontal pattern gives us the sense we’re watching this on a screen, or through blinds, but the scale dwarfs us. The pale glare of the sun is sickening. Its reflection creeps like an infection. Sunset, meet hangover. These works are not for the weak of stomach. They even feel as if they could trigger seizures, although they don’t literally flash or oscillate. Yet they are thrilling. The first ones I encountered, in the series “Wald bei Colditz, I-VI” depict a blighted forest. Baumgartner coaxes shades of gray from a dense frenzy of blotty, black-and-white gullies. Bare white branches scratch across the surface like fingernails on a blackboard. Shadows engulf and dissolve. These trees are dead, and their image on the constant cusp of disintegration. Time stands still, and the forest, screaming with ghosts, holds on.